Kyiv International Institute of Sociology conducted its own public opinion poll “Omnibus” in a period from 2nd to 12th of December, 2016. The survey was conducted in 110 settlements (PSU) in all regions of Ukraine, except for the AR of Crimea, with the use of the stochastic sample that is representative of the population of Ukraine aged 18 and above. The sample consisted of 2040 respondents who were interviewed. In Luhansk and Donetsk oblasts (regions) survey was conducted only in the territories controlled by Ukraine. In this case, the sample was distributed on the controlled part of Donbas in the proportion that was registered in CEC for Donbas voters in the last parliamentary elections (October 2014). 3.3% for indicators close to 50%, 2.8% — for indicators close to 25%, 2.0% — for indicators close to 10%, 1.4% — for indicators close to 5%. The most trustworthy institutions for the Ukrainians are the church, volunteers and the Armed Forces of Ukraine. The least trustworthy are the government of Ukraine, Russian mass-media and the Verkhovna Rada of Ukraine (these institutions` trust rate among the population is less than 10%). In general, the trust rate changed significantly over the past year (Graph 1). There is a tendency for the decrease of the Ukrainians rate of trust toward the social institutions. The church. The church still holds the leading position in the trust rating. The rate of trust toward the church remained almost the same since 2015 (Graph 1). Volunteers and non-governmental organizations. The trust-mistrust balance toward volunteers decreased comparing to 2015 (from 44.1% in 2015 to 33.9% in 2016) (Graph 1). However, more than a half of the Ukrainians still trust them, the trust-mistrust balance toward non-governmental organizations did not change much (Graph 1). Ukrainian and Russian mass media. Ukrainian mass media are still trusted by the one fourth of the population but it is much less comparing to the previous year (Graph 1). 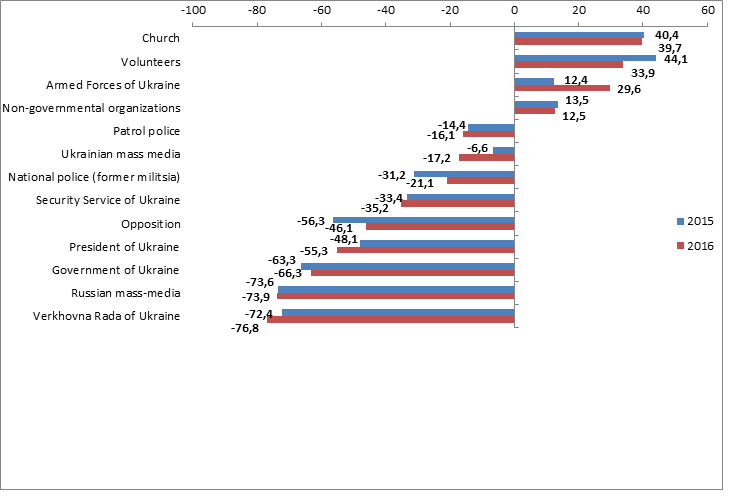 Positive level of trust toward it is preserved only in the Western region, the population in the East of Ukraine does not trust Ukrainian mass media at all (Table 4). As it was before, Russian mass media keep the outsider position, level of trust to them is low in all regions (Table 4). Power structures. Trust to the Armed Forces of Ukraine increased significantly – more than half of the Ukrainians trust this institution. It did not only keep the positive trust balance but more than doubled it. This institution receives the most trust from the Western region and the least – from the Eastern region (Table 3). Trust of the Ukrainians to other security and law institutions is much lower (Table 1), and they keep the negative indicators of trust-mistrust balance. It should be noted, that we are observing a significant improvement in the trust rate of the national police comparing to the previous year (Graph 1). The Eastern region more than others does not trust both national and patrol police, while the Western trust the police the most (Table 3). Government institutions. Government institutions (Government and Parliament) have the lowest trust rate and a very low trust-mistrust balance among the Ukrainians. However, compared with the previous year, the trust-mistrust balance of the government slightly increased, and the balance of trust to the Verkhovna Rada of Ukraine decreased (Graph 1). The opposition has better trust-mistrust balance than the president does, but it is negative anyway (13% trust and almost 60% do not trust the opposition; 70% do not trust the president). The trust-mistrust balance of the opposition improved compared to last year, while the balance of trust - mistrust of the President of Ukraine decreased (Graph 1). The opposition has the most trust in the Eastern region and the least - in the Western region of Ukraine. Vice versa, President receives more trust in the Western region and less in the East (Table 2). I will name you some social institutions. Answer please whether you trust the institution I name?